Happy Labor Day! Hope you’re enjoying your long (last) summer weekend. I’ve spent mine all over Southern California – from Malibu to south Orange County. I’ve been eying collar necklaces for a few months now so when I spotted this one at h&m I knew I had to get it! It adds so much to even the simplest look, like what I’m wearing here. But it will also be fun to add to a dressier top or dress to finish it off. I know lots of people think this is “technically” the last day to wear white jeans, but I think that’s a dated rule. I plan on wearing mine for at least another month but probably longer… and I’ll switch to winter white when it finally cools down here. 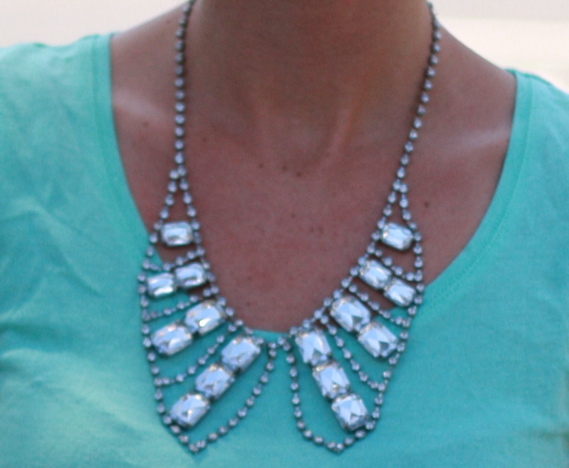 LOVING THIS COLLAR NECKLACE..GORGEOUS! THE PERFECT TOUCH WITH THE TEE! Truly an adorable look Ash….that collar necklace will be fabulous on any basic item of clothing you own! love that color on you so fresh and so clean! xO! Really pretty necklace! I almost bought it…now I’m kind of sad…haha. But I have those Target booties and they are great! Great necklace. And I’m with you- I keep wearing white, no matter what season it is. Gorgeous outfit! Love the booties! !